To complete configuration of Ubuntu machine that I’ll use later for Oracle Development, let’s install JDeveloper, Oracle’s main Java development tool. Although JDeveloper is free, it has never had any significant traction among Java developers. In Java IDE space there are several great competitors, starting with Eclipse, IntelliJ and NetBeans. With such competition it’s difficult to gain more traction. But for development based on Oracle software, JDeveloper has some feature you won’t find anywhere else. Installation of JDeveloper is really trivial. As prerequisite you need to have JDK 8 installed prior to launch installer, and to download appropriate installation files (2 files). You can either choose platform specific installer (.exe files on Windows or .bin on Linux) or Generic (with .jar extension). This Oracle software was not certified on the current operating system at the time it was made generally available. It’s interesting to see that most popular Linux distribution was not certified yet. It means if you hit some issue, you are on your own. Only Linux community answers might help. Anyway, the most important is Java version, and I had no issues with JDeveloper installation. As the last check I advice to try some Java code that will connect to Oracle database. Here I have to say that JDeveloper is not intuitive like some of it’s competitors, and you’ll need to take time to get used to. 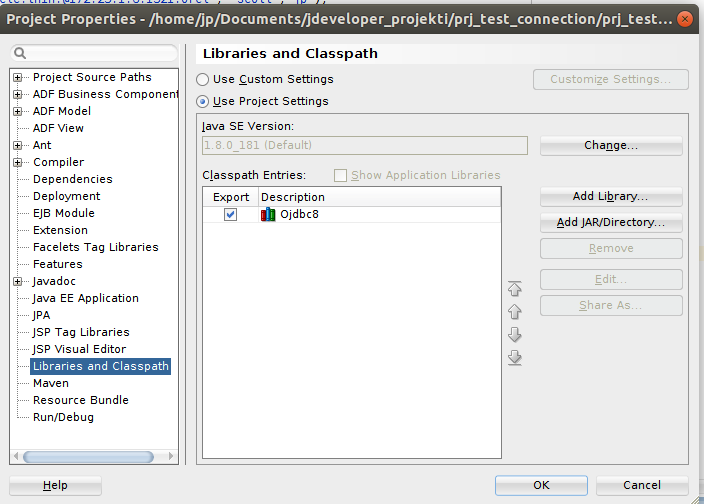 The most important is to add ojdbc8.jar in classpath of JDeveloper project like in the following figure. Location of the Oracle jdbc driver is inside Instant Client directory that I’ve installed before. I found installation of JDeveloper on Ubuntu to be straightforward, if we ignore one warning because Ubuntu was not certified. Main problem you can see later, when you actually start to use JDeveloper, as to be modest, JDeveloper is not the most intuitive Java IDE that I’ve seen so far. You need to get used to how JDeveloper is organizing your projects (Application –> Project…), and to catch it’s logic, as it’s way of work is quite different from what you would expected. The only disappointment for me is fact that Ubuntu is not certify to work with JDeveloper, but untill everything is working as expected, I can ignore certification issue for now. Hopefully Oracle will add Ubuntu on the list of supported OS. Although I could add several more tools and expend the list, I consider listed tools to be solid basis for starting modern Oracle development.